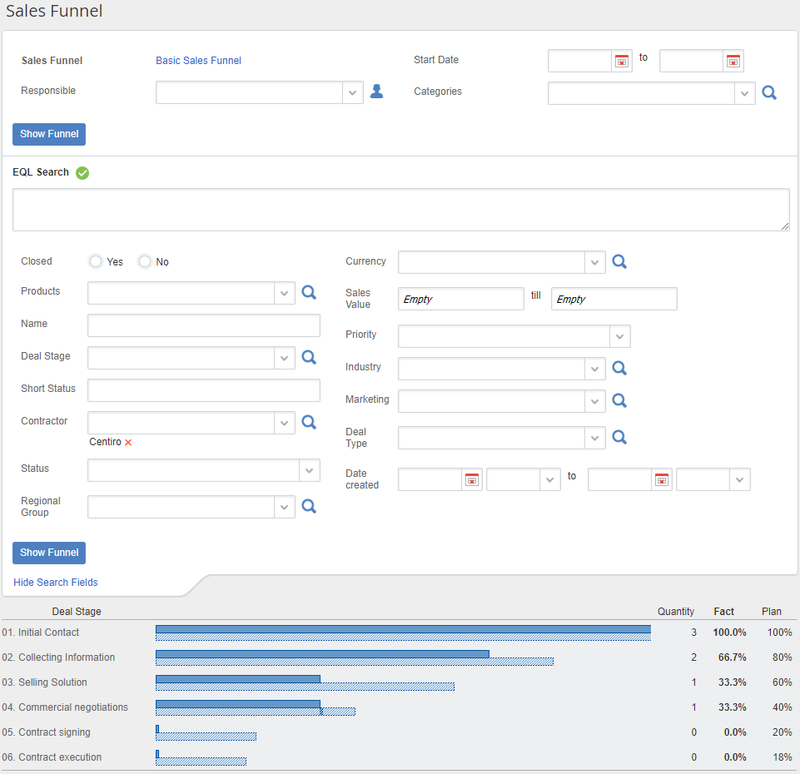 ELMA: CRM+ ›	Configuring Sales Funnel. Linking Business Processes to the Funnel. Sales Funnel is a customer management tool that allows assessing how effective was a sales rep or the entire sales department at any stage of the sale. The idea is that at each stage a sales rep work with a certain number of clients; once the stage is complete, some of the clients "drop out" and some move to the next stage; it continues until a sale is made. ELMA allows configuring a sales funnel from any perspective: by deal statuses or region, by department or individual reps, i.e. by any parameters you specify in the Advanced Search. You can create several sales funnels. To do so, you need to create instances of the Sales Funnel object. To create a sales funnel, go to Objects – CRM – Sales Funnel and click Create. To learn more, see ELMA Help. At this step, you need to define the deal stages that will be included in the sales funnel. The created sales funnel must be specified in an instance of the Deal Type object. 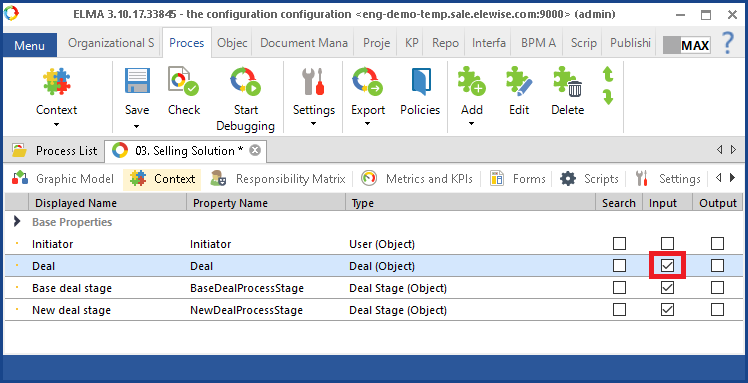 Go to Objects – CRM – Deal Type and click Create. Enter a name and select the created sales funnel. Once you've configured the sales funnel, users will be able to change stages according to the specified Deal type. To learn more, see this Help page. When changing deal stages, data will be added to the sales funnel. To learn more about deal stages see this Help page. 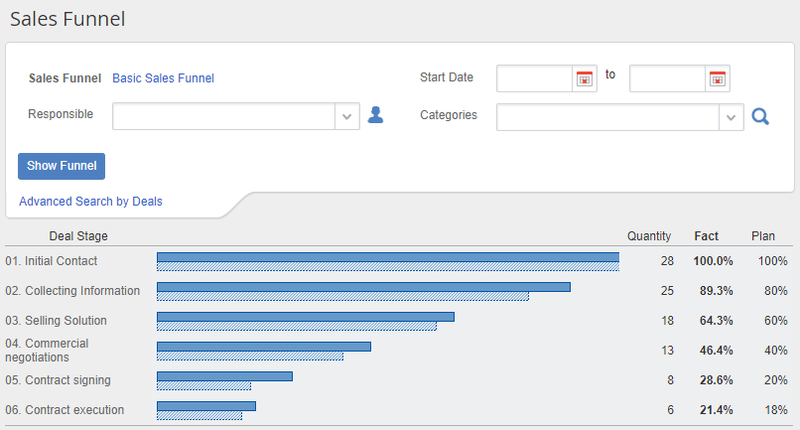 To view a sales funnel, open the Sales Funnel page and select the required funnel in the filter tree (CRM – Sales Funnel). The report shows the information about deal stages and the number of deals that have gone through particular stages. You can also use the advanced search and select, for example, a contractor. The report will display the information related to this contractor. You can get more information on deals from the Deal Dynamics report (see this Help page). 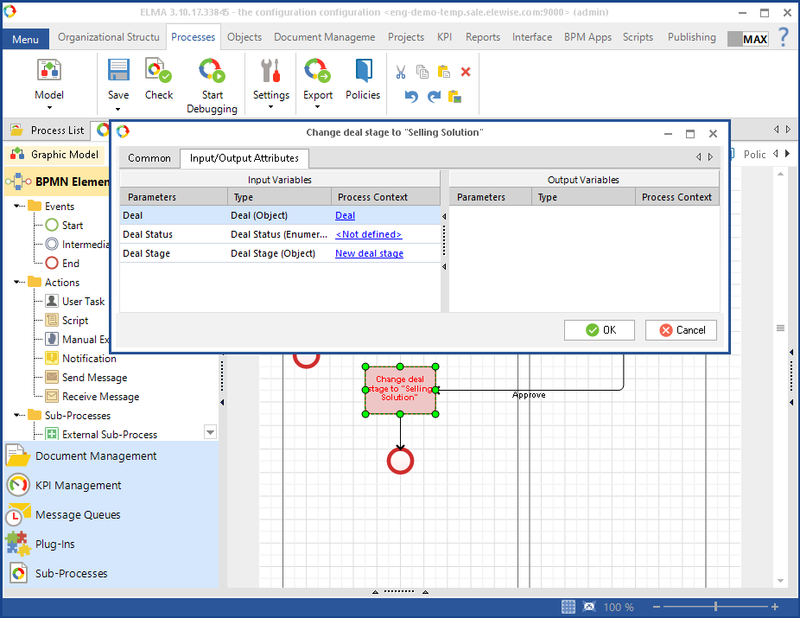 Cancel – close the dialog box. To create an active sales funnel, go to Objects – CRM – Sales Funnel and click Create). To learn more, see the Help page. At this stage you need to identify deal stages that will participate in the funnel. Also you need to add business processes to transitions between stages. 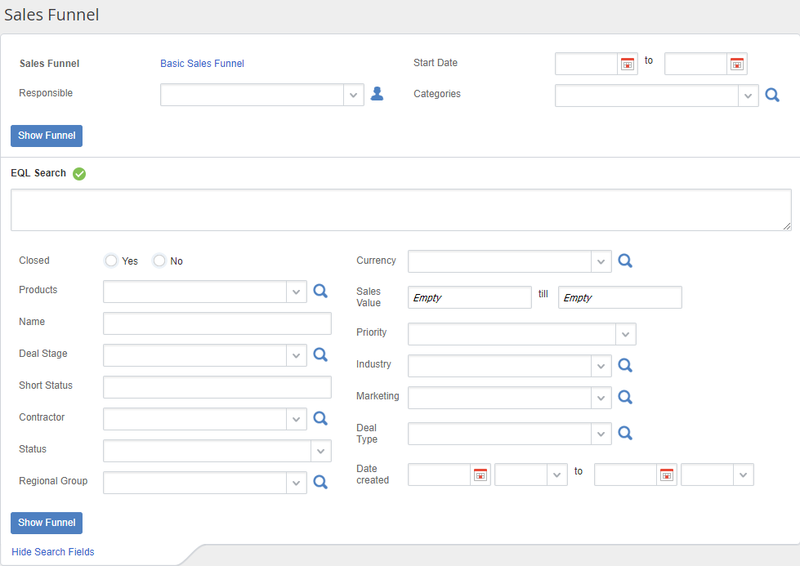 After configuring the sales funnel, users will be able to change stages according to the selected Deal Type. To learn more, see this Help page. When changing a deal stage, the sales funnel will be filled in. 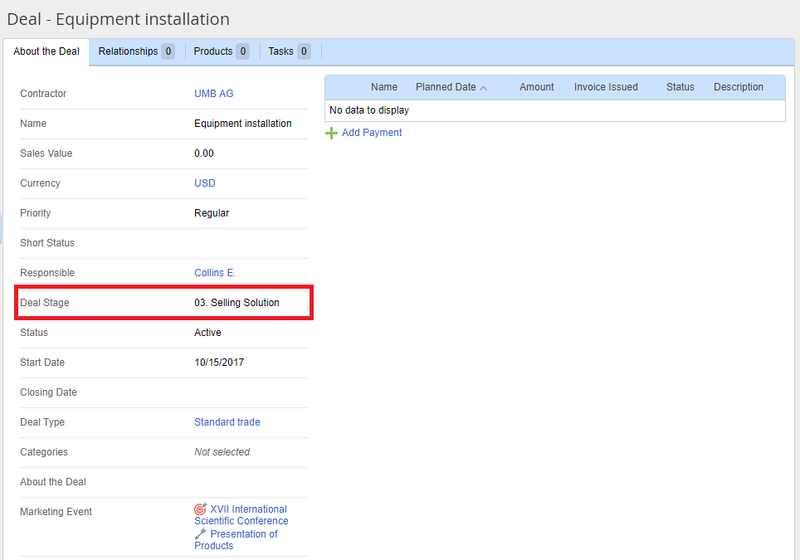 If a process is specified in the transition between stages, it will be started automatically. For example, when changing to the 03. Selling Solution stage, a business process is started. create a Deal type variable for these processes and mark it as Input. 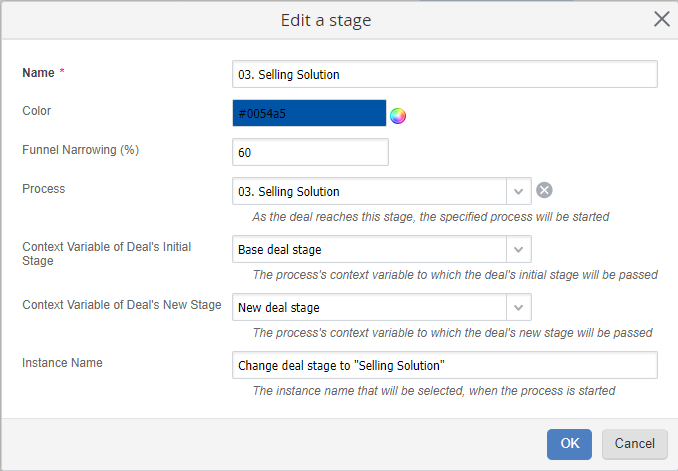 To change a deal stage in the process, you can use the custom activity Change deal properties or a script. To learn more about custom activities, see this Help page. Thus, using the active sales funnel ensures adherence to the sales process procedures.